ARM has unveiled two new members of its Mali family of GPUs. The new units are the Mali-T720 and Mali-T760. The T720 is a mid-range GPU and is seen as the successor to the very popular Mali-400 MP and 450 MP GPUs, while the Mali-T760 is ARM’s new flagship GPU and boasts a 400% increase in energy efficiency when compared to the Mali-T604. At the moment around 50 percent of all Android tablets use SoCs with Mali GPUs which makes this new announcement by ARM significant in terms of the graphic processing power of tablets in the future. However it isn’t only tablets that use Mali GPUs, around 20 percent of Android smartphones have a Mali GPU and the new Samsung Galaxy Note 3 features the Mali-T628 with 6 shader cores. ARM’s previous mid-range GPU’s were based on its now ageing Utgard Architecture which can be found in the Mali-300, 400 MP and 450. 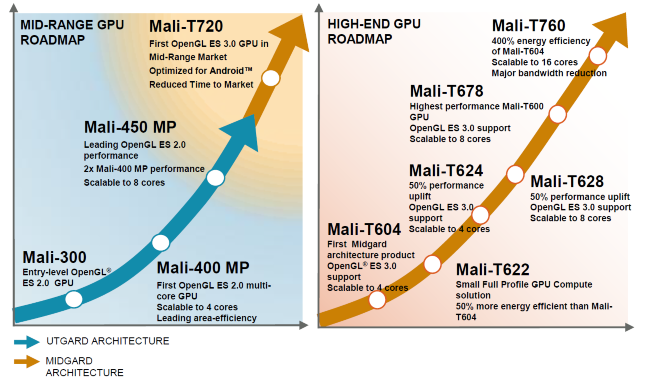 Starting with the Mali-T604 ARM switched to a new GPU architecture known as Midgard for its high-end GPUs. ARM has now brought this new architecture to the mid-range with the Mali-T720. The new Mali-T720, which can be used with ARM’s current Cortex-A7 and A12 cores as well as the upcoming 64-bit Cortex-A53 core, can run at a maximum clock speed of 600MHz and has a peak performance of 81.6 GLOPS with a pixel fillrate of 4.8 Gpix/sec. To put those numbers into some context, the Mali-400 MP configuration found in the Exynos 4412 peaks at 19.2 GFLOPS and a has theoretical pixel fillrate of 1.6 Gpix/sec. Although the Mali-T720 offers better performance, ARM has managed to reduce the energy usage and the die size of the GPU. According to ARM the Mali-T720 has a “150% energy efficiency increase over previous cost optimized GPUs” and has a “30% area reduction from previous Midgard generations.” This is all possible because the Mali-T720 is designed using new small chip manufacturing processes (28nm) which has also allowed ARM to squeeze in up to 8 shader cores. The Mali-T720 has been optimized especially for Android and offers support for OpenGL ES 3.0 and RenderScript. 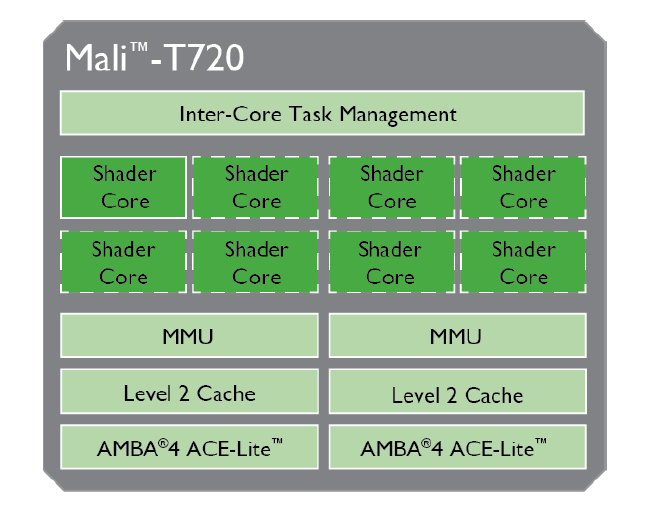 At the other end of the scale, ARM has released details of the Mali-T760 which now becomes its de-facto flagship GPU. The new device scales up to 16 shader cores (giving 326 GFLOPs) while boasting a 400% increase in energy efficiency over the ARM Mali-T604. The simplicity and feature rich design of the Mali-T760 GPU enables Rockchip to quickly bring new SoCs to market with the latest Android advantages in a wide range of mobile devices. -- Feng Chen, chief marketing officer, Rockchip. One of the tricks in the Mali-T760’s architecture is the use of bandwidth reduction techniques which minimizes the amount of data shifted around and hence reduces the amount of power used by the GPU. Such techniques include ARM Frame Buffer Compression (AFBC), which compresses the data as it is passed from one part of the SoC to another, and Smart Composition which only renders the parts of the frame which have changed. For example when playing Angry Birds the whole frame doesn’t need to be re-rendered, only the bits where the bird has flown and hit those very bad piggies. By not re-rendering the other parts the GPU saves power! At 600MHz with 16 shaders the Mali-T760 has a peak performance of 326.4 GLOPS and a pixel fillrate of 9.6 Gpix/sec. That should make the Mali-T720 the fastest mobile GPU available! 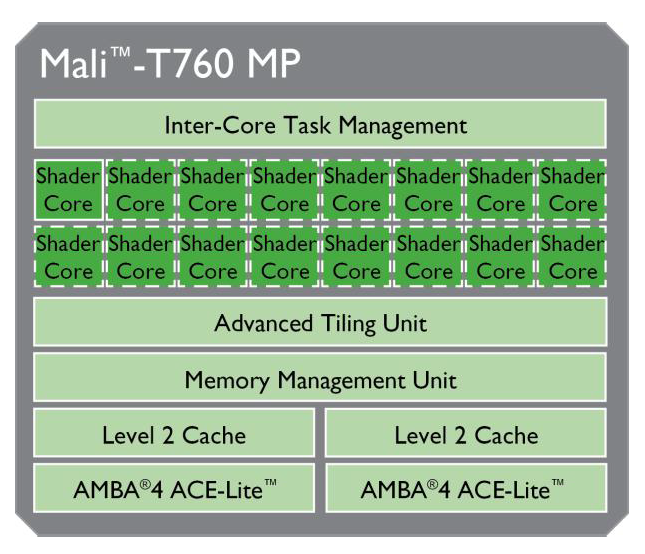 Another important aspect of the Mali-T720 is its full support for OpenCL. At the moment the Mali-T720 is the only mobile GPU that can run all the OpenCL benchmarks and this chip really marks the full arrival of GPU computing on smartphones and tablets. GPUs are better at certain operations than CPUs. Although a CPU can perform the same tasks they will be handled in software and are therefore slower and less efficient. A GPU can better handle certain tasks like those associated with facial recognition, gestures, computer vision and augmented reality. By utilizing the GPU the CPU is freed and on a big.LITTLE system the SoC can switch to the more energy efficient CPU cores while the GPU is working of the GPU compute tasks. This makes the GPU a companion to the CPU which can do more than just render frames for the display. ARM currently has 84 Mali license holders and the new Mali-T720 and T760 have been licensed by companies like LG Electronics, MediaTek and Rockchip. Missing from the list is obviously Apple and Qualcomm, however Samsung continues to use Mali GPUs in some of its SoCs. The Exynos 5420, found in some variants of the Galaxy Note 3, dropped the Imagination PowerVR SGX544MP3 GPU in favor of the ARM Mali-T628 MP6 GPU. According to Trina Watt, Vice President of Solutions Marketing at ARM, it is likely that SoCs using the new GPUs will become available by the end of 2014 meaning that some of the next generation of smartphones and tablets launching at the Mobile World Congress in early 2015 will feature these GPUs. By that time 64-bit mobile computing will be firmly established and the use of 4K video will also be on the rise, technologies which the new GPUs support out of the box.